I don't know if I should apologize or just warn you that Tod decided to add one of his favorite songs to my new playlist. The first person to guess which song is Tod's wins a hairless Barbie doll head. I sure hope it's 16 tons. Ryan totally started singing along with it. I want my Barbie head. I'm guessing 16 Tons, not because I don't like the song, but because it looks like it came from a different playlist (all lowercase letters). I'll pass on the Barbie head, but I'd like my cookie for leaving a comment. 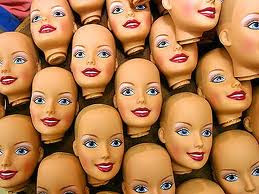 Barbie head is all yours, Kristin.